This week has been a hellish week, weather wise. I'm so glad that today will finally be a lot cooler. And when 85 is cooler, you know it was bad! But this weather did prove for some good swimming! I took the kids to our community pool Monday and Tuesday, and GG went to a friend's uncle's house to swim in his pool. Wednesday we took a much needed swim break to hang out in some air conditioned stores for much needed grocery shopping, but yesterday we were back at the pool. Yesterday we met up with a friend, her daughter, and her daughter's friend to go to the wave pool. I was a little apprehensive because Little Dude is just now used to being in the big pool. But he still doesn't know his limits. I warned him that a horn sounded before the waves began and the I would have to hold his hand. Further out the waves would go over his head and if we stood where they would break, he would most likely get knocked over. Not good for a boy who hates getting water in his face! Even though both kids swallowed too much pool water, we all had a blast! GG even started swimming a little better. I tried taking some pictures of the kids in the pool, but with the sun and the glare off the water, I wasn't sure if they would turn out. We didn't want them too far in the water after lunch. For a bit they stood in the shallow end and jumped over the waves. The heat didn't seem to bother anyone too much, as long as we were in the pool. Back home where we don't have AC and the fans can only help so little much, I needed to find a way to keep everyone cool. Wednesday night I remembered I still had a cookbook from when I was a kid. In this cookbook is the best milkshake recipe. Ever!!! Place ice cream, apple juice, cinnamon, and nutmeg in an electric blender container. Cover container. 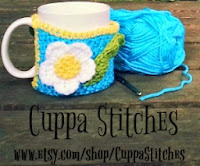 Turn blender on to high speed and blend for about 30 seconds or until smooth and well blended. Even the husband, who rarely eats sweets, liked them. Little Dude whined and cried begged and pleaded until he took a sip. The weather has been BRUTAL! We went to the pool yesterday too. 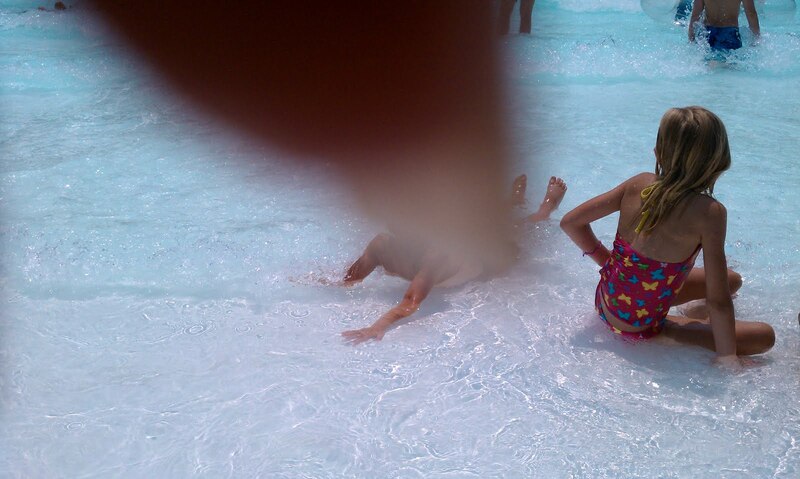 :) Glad you had fun and the kids did well at the wave pool! We haven't ventured there yet. The pool is the place to be in this weather! What fun! My boys don't know their limits very well in pools, so I have severe anxiety the whole time we ae at a pool, but it's getting better. Sounds like a great time was had by all. Oh my that is amazing.. Thanks for sharing this for Family Fridays and my Round Robin..
Have a great day and weekend..
you can do better than you assume. it's so hot here too-yuck! 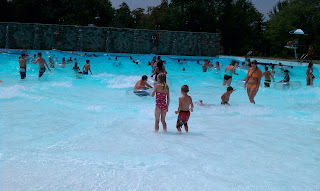 wave pool looks nice and refreshing-I know my kids would love it! Thanks for the shake recipe-sounds yummy! We spent lots of time at the pool this week too. Although it was warmer in the northeast than it was down here Below the Mason Dixon Line! That shake sounds yummy! Thanks for stopping by Single Mom in the South! Mmm. I've been on a smoothie-binge lately, but a shake does sound good! Oh, that pool looks terrific!! It's been dry and blistering hot here, too! I could use a nice dip!! Thanks for sharing this recipe, I am DEFINITELY trying it! Cheers!